We offer two Complete Screen Goo Kits which include everything you need to make a High Quality Home Theater Screen up to 130" diagonal. 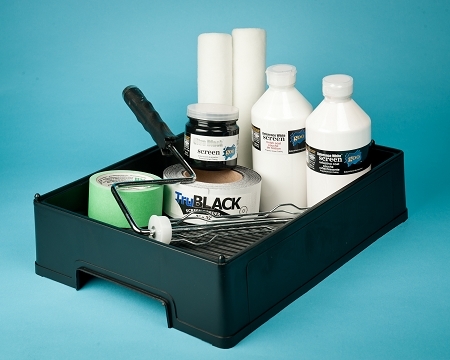 Standard Screen Goo Kits - Our Standard Screen Goo Kits include 1000mL each of our standard Reference White, High Contrast or Max Contrast Reflective Basecoats and standard Finish Topcoats, 250mL Ultra Black border paint, 4L Paint Tray, Roller Handle with 2 premium Roller Refills, a 2" Foam Applicator, 32'x2" Flock tape, 60'x2" Painter's tape and complete instructions on how to put it all together. 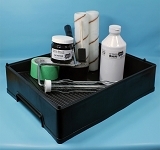 +20 Screen Goo Kits - Our +20 Screen Goo Kits include 1000mL each of our standard Reference White, High Contrast or Max Contrast Reflective Basecoats and our+20 Finish Topcoats, 250mL Ultra Black border paint, 4L Paint Tray, Roller Handle with 2 premium Roller Refills, a 2" Foam Applicator, 32"x2" Flock tape, 60'x2" Painter's tape and complete instructions on how to put it all together. Why Use +20 vs. our standard matte Reference White Coatings? There are installations where a desired level of black level enhancement is achievable with our classic standard Screen Goo formulations, but where there is not enough projector light output available to provide a sufficiently bright image. In these instances, a screen surface with greater controlled reflectivity or gain can be a valuable option. Our new +20 variants now make this option available in all of Screen Goo's award-winning front projection coatings. Everything you need to make a great screen on a budget!